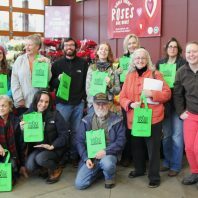 What do Sustainable Community Steward Volunteers Do? Each Sustainable Community Steward crafts their own volunteer experience, selecting the activities and schedule that fit into their lives. 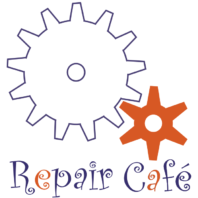 Types of support can include: writing newsletter articles, identifying new project options, researching continuing education opportunities, event coordination, community outreach, public speaking, office administration support, and more! 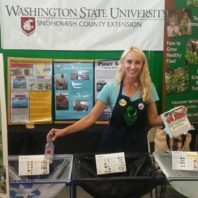 Over the past 5 years, Sustainable Community Stewards have diverted over 15,000 pounds of food waste and compostable ware from the landfill, tested over 900 cars for leaks, and taught over 500 people how to make their own non-toxic tub scrub. These impacts are especially important since Washington State’s recycling rate is stagnate at 51%, over 7 million quarts of oil leak into the Puget Sound watershed each year, and over half of the Snohomish County residents surveyed in 2016 did not know about the Household Hazardous Waste facility. 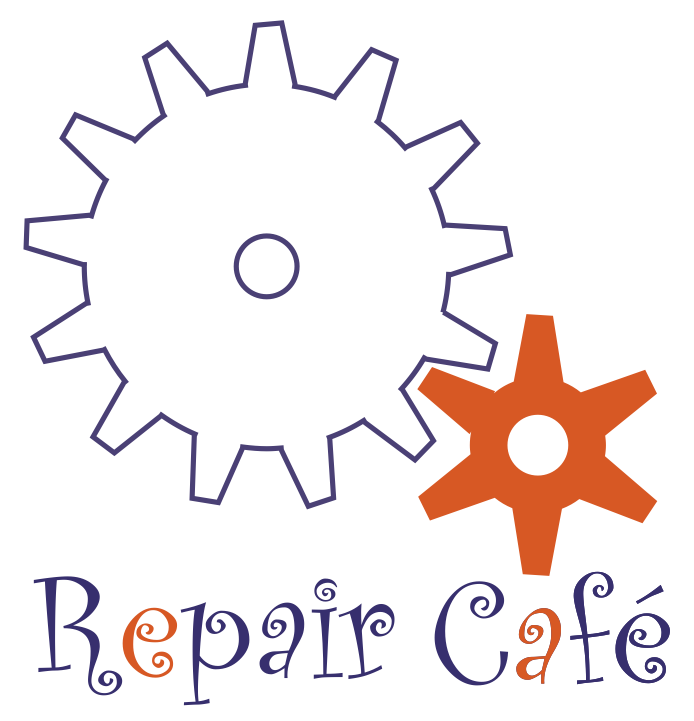 Take a look at our April and March Newsletter for more news! Who are the Sustainable Community Stewards? Sustainable Community Stewards Outreach Program volunteers receive over 40 hours of initial training with a wide scope of focus on environmental sustainability that helps individuals and communities to adopt practices that result in cleaner water and air for all to enjoy over time. Training content is grounded in credible climate change and natural resources science that are relevant in Snohomish County. 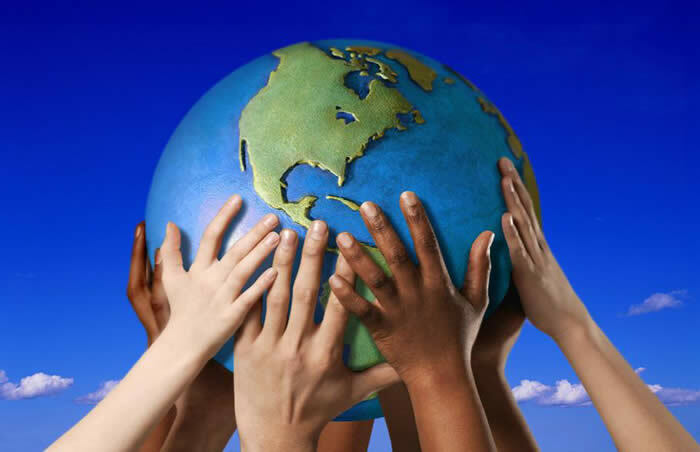 SCS Volunteers then use that education to educate and encourage other community members to adopt practices that protect and conserve the environment and world we live in. Want to join the efforts and make a difference in your community? Contact us about information on how to get involved! What is a Waste Warrior? 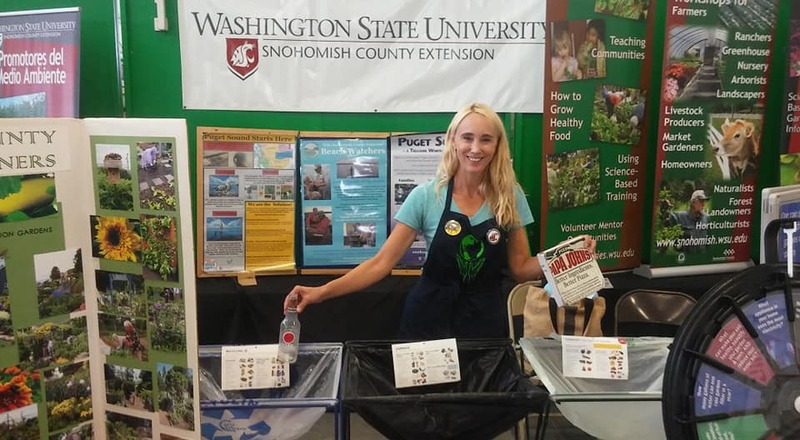 Waste Warriors are provided 20-hours of WSU Extension program level training that focuses on best practices in waste reduction and waste diversion through proper recycling and composting or foodcycling. Trained volunteers then educate fellow community members at local events. Be the change you want to see in your community! Bring a reusable bag with you shopping, or buy in bulk. 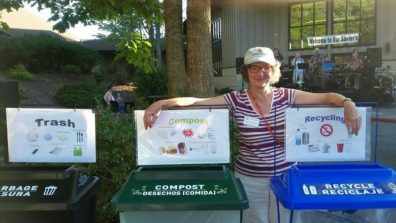 Check out your recycling guide find out what you can recycle: Rubatino (Everett), Waste Management, Sound Disposal (Edmonds Bowl), Republic, and Recology (Bothell). Put your food scraps into a compost pile, or a yard waste bin! See the WSU Foodcycling page for more info. Dispose of household hazardous waste properly and use green cleaning products made from safe ingredients! Carpool or combine trips whenever possible. Carry reusable utensils and containers when taking food to go. Buy locally-grown, organic food – local farmers markets are a great resource! Recycle more paper! See the WSU Papercycling page for more info. Plant native trees and shrubs in your yard. See our Native Tree Guide for help!